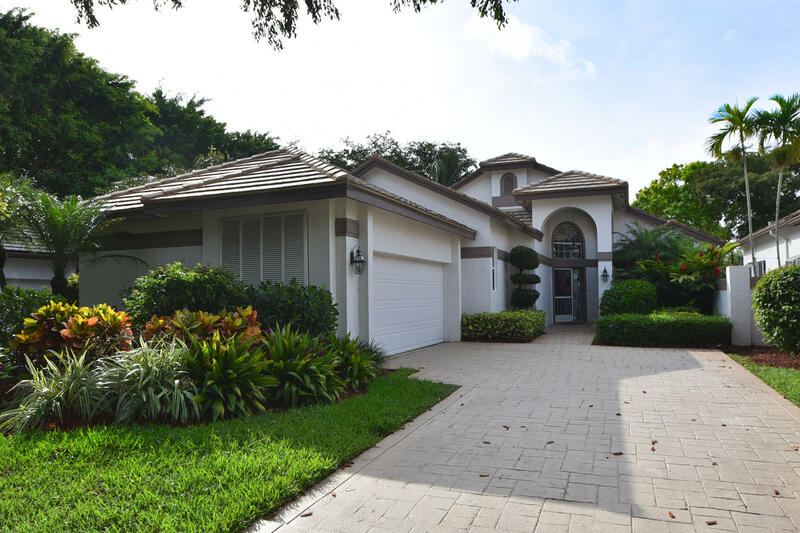 All WHISPER TRACE homes currently listed for sale in Boca Raton as of 04/21/2019 are shown below. You can change the search criteria at any time by pressing the 'Change Search' button below. 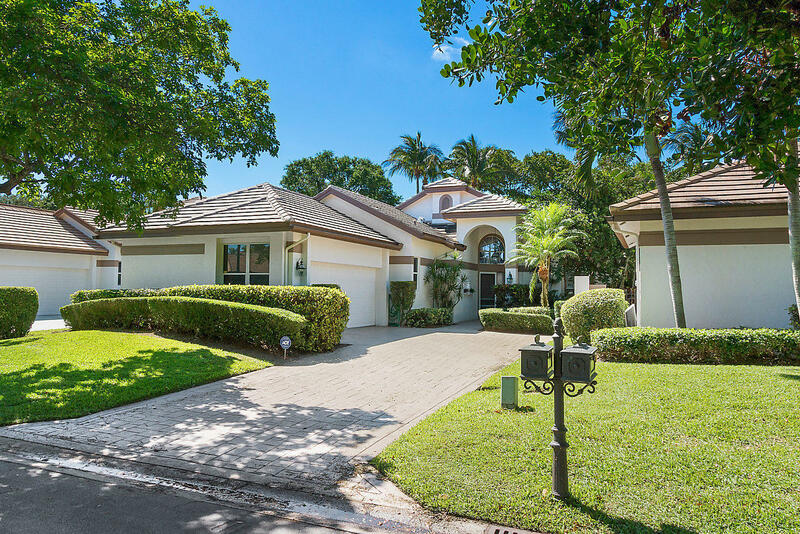 If you have any questions or you would like more information about any Boca Raton homes for sale or other Boca Raton real estate, please contact us and one of our knowledgeable Boca Raton REALTORS® would be pleased to assist you. "Welcome to the beautiful subdivision of Whisper Trace in Broken Sound Club. This 2 bedroom plus den is one of the most popular floor plans in the community. The colors are neutral, the kitchen and master bath are remodeled. A large porch has been enclosed offering a second large sitting area overlooking the pool. The deck is travertine pavers. Very bright, open and a private backyard. A must see! Mandatory membership required." "MOVE RIGHT INTO THIS COMPLETELY REMODELED, FROM THE ROOF TO THE FLOORS, FABULOUS 3 BEDROOM HOME! THE ATTENTION TO DETAILS IS AMAZING. 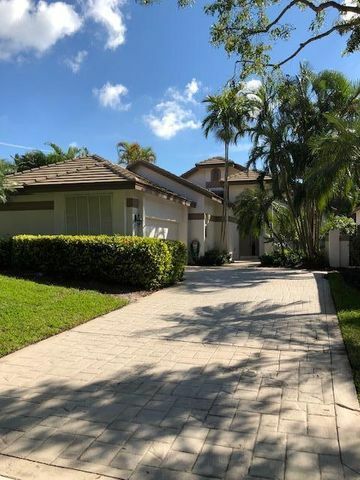 GORGEOUS KITCHEN AND BATHS, NEW AC, NEW HURRICANE IMPACT WINDOWS AND DOORS IN THE SUN ROOM, HURRICANE SHUTTERS, INCREDIBLE OVERSIZED PATIO THAT OFFERS COMPLETE PRIVACY AND STILL HAS AMAZING VIEWS OF THE GOLF COURSE. THESE ARE JUST A FEW OF THE REASONS THAT THIS INCREDIBLE HOME IS A MUST SEE PLUS IT IS WITHIN WALKING DISTANCE TO SCHOOLS, SHOPPING, RESTAURANTS AND HOUSES OF WORSHIP." "This 3 bedroom, 3 bath home plus a den has a remodeled kitchen, high ceilings, no popcorn, smooth walls, open floor plan, cozy den, and a large great room that has been extended with a view overlooking the outdoor area and pool. The master bedroom is large with 2 walk in closets. Best of all is a pool that is long enough to swim laps in , situated along the side of this beautifully landscaped home. This house is located in the award winning country club at Broken Sound. Enjoy the Florida lifestyle at its best! Mandatory membership required ." "Beautiful 3 bedrooms, 2 bath, Marble floors, new roof, Cathedral ceilings, built-in closets, new water heater, great pool area." 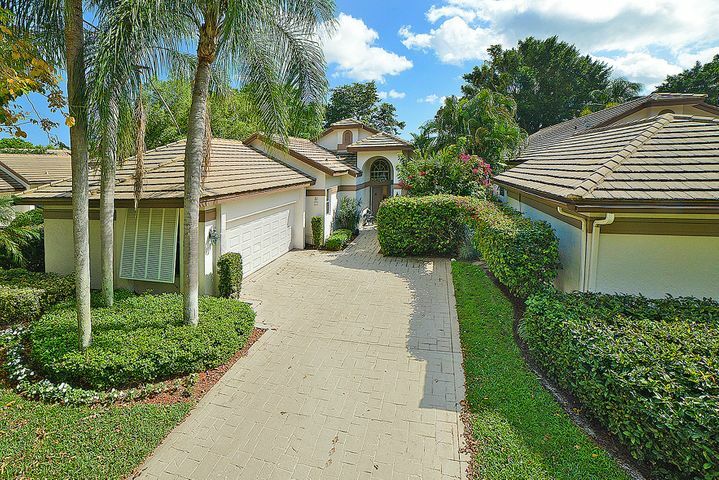 "THIS BEAUTIFUL HOME IS LOCATED ON A BEAUTIFUL GOLF COURSE LOT IN ONE OF BOCA RATON'S BEST CPUNTRY CLUBS, BROKEN SOUND! THE WONDERFUL OPEN FLOOR PLAN INCLUDES ALL NEW BATHROOMS, NEW AC UNIT, NEWER HOT WATER HEATER, PORCELAIN FLOORING, HIGH CEILINGS, GRANITE COUNTER TOPS, STAINLESS STEEL APPLIANCES, CUSTOM BUILT-INS. ENJOY SPECTACULAR GOLF COURSE VIEWS AND CHOOSE ANY LEVEL OF MEMBERSHIP.EXLUDED: CHANDELIERS IN LIVING ROOM, MASTERBATH AND EAT IN KITCHEN"
"Warmth envelopes you as you enter this gem tucked away in the village of Whisper Trace located in the award-winning club of Broken Sound. 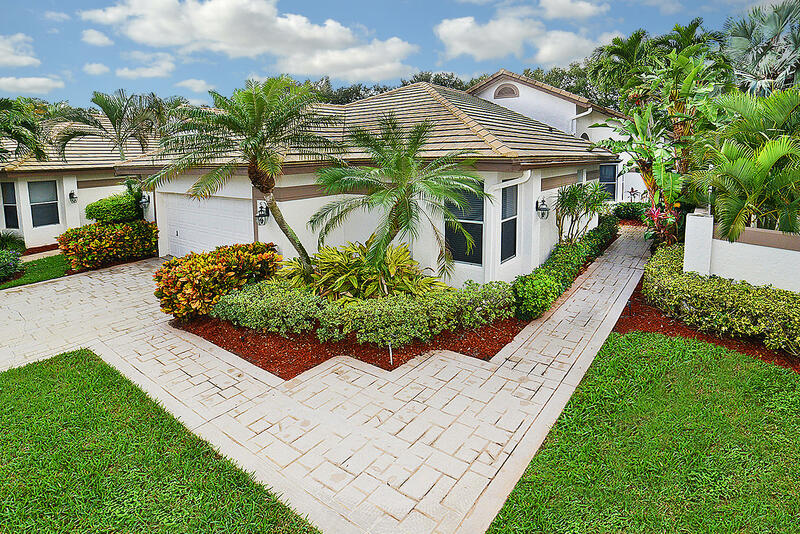 The beautiful porcelain tiles in this 2 bedroom + den home guide you to the fabulous view of the golf course. Kitchen includes an additional glass-enclosed atrium looking out over the flourishing landscaping. Master bedroom includes walk-in closets, and a separate tub and shower. Full guest bathroom includes a shower/tub combo, and custom mosaic sink. 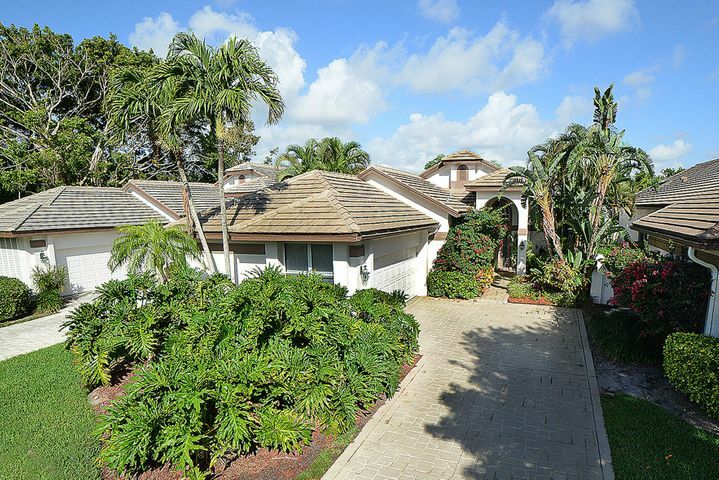 Expansive, yet private, backyard with beautiful tropical landscaping. 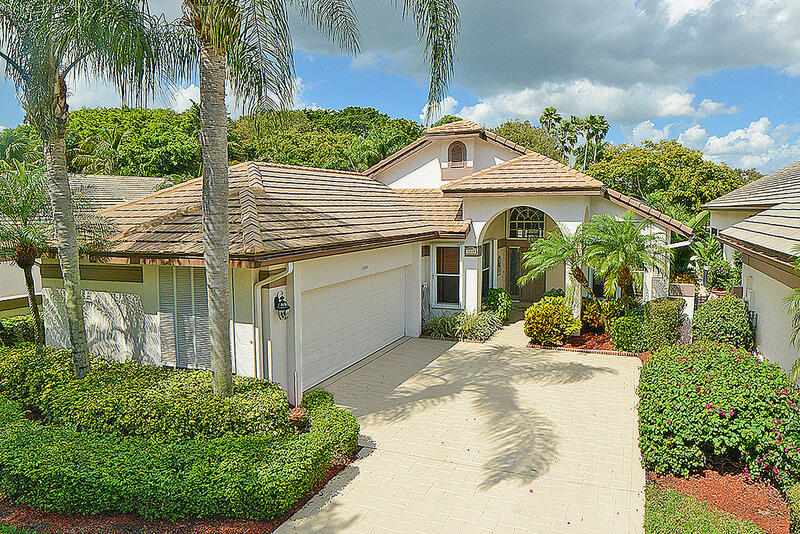 Hurry in today for country club living in sunny South Florida!" "Located in the award winning club of Broken Sound, this 2 bedroom/2 bathroom home boasts a remodeled kitchen. Enjoy a view of the pool from the family room, dining room, and built in bar. The backyard is complete with lush tropical landscaping, creating your own escape within the private village of Whisper Trace. Additional desirable features include high ceilings, neutral floors, and new air conditioning (2017), roof replaced approximately 2007. Hurry in today to secure your slice of paradise! Mandatory membership required."